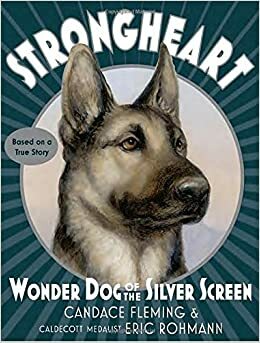 Summary: Move over Charlie Chaplin and Mary Pickford; Strongheart is center stage in this novelization about a real-life canine silent film star. When 1920’s-era director Larry Trimble had the idea to make a movie about a dog, he traveled all the way to Europe in search of the perfect animal. He discovered Etzel, a ferocious German shepherd police dog, and was able to see past the growling and snapping to an intelligent, loveable pet. They teamed up with screenwriter Jane Murfin to produce six films, making Strongheart a celebrity. He never lost his police dog instincts, though, and the end of the book has him standing in his own defense at a trial to determine if he killed a little girl or not. Several of his youngest fans come to his aid, and not only Strongheart is declared innocent, he helps apprehend the real criminals. (Don’t worry, there’s no real murder; it was all a money-making scam). End matter includes the facts about Strongheart and his career, photos, a bibliography, and notes. 256 pages; grades 3-6. Pros: Dog lovers will be enchanted with Strongheart, from his early days as a puppy forced to become a vicious police dog to his movie star career, and finally full circle to the father of his own puppies. Illustrations on almost every page make this a good choice for reluctant readers. Cons: I was disappointed to learn that only one of Strongheart’s films, his last one, still survives.